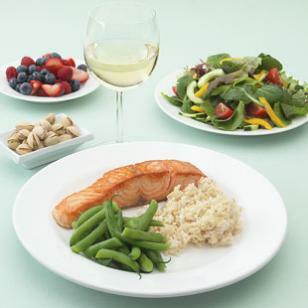 How to choose the right calorie level for your 7-day meal plans. Our menus are simple to follow and designed by EatingWell’s nutrition staff with a variety of healthy, delicious recipes, an abundance of whole grains to help you feel full, and healthy amounts of fresh fruits and low-fat dairy foods to make sure you are meeting your basic needs for calcium, protein and other essential nutrients while you are dieting. Our menus come in five calorie levels: 1,200, 1,400, 1,600, 1,800 and 2,000, and are rounded out with healthy snacks to keep your diet interesting and help you to feel satisfied. You’re likely to lose weight on any of these plans since shedding pounds is a matter of consuming fewer calories than you expend and most women eat more than 1,800 calories a day and most men eat more than 2,000 calories a day. So, how to choose what level is best for you? One option is to take a simple approach: If you’re a relatively small person or someone who doesn’t have much weight to lose, shoot for a lower-calorie goal. (The lower you go, the faster you lose—but there’s no point in setting up unrealistic expectations if you can’t meet them.) If you’re a tall person or someone who is carrying quite a few extra pounds or if you’re a very active person, you’ll probably do quite well on the higher-calorie plan. If you’re not sure, start in the middle (for women start at 1,600 calories; for men start at 1,800 calories), and adjust up or down based on how satisfied you’re feeling—both physically and about how quickly you’re losing weight. Download a FREE Low-Calorie Dinner Recipe Cookbook! Download a FREE Low-Calorie Lunch Cookbook!